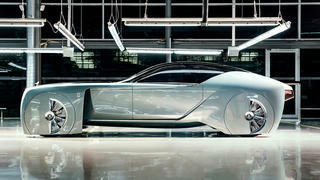 Luxury British car manufacturer Rolls-Royce has unveiled its first driverless car: the Vision Next 100. Codenamed 103EX, the zero-emission concept is one of four ‘Vision Vehicles’ designed to celebrate the centenary of Rolls-Royce’s parent company BMW, alongside similar concepts from Mini and BMW itself. As one would expect of a Rolls-Royce vehicle, the new electric car is a super-luxurious model aimed at those members of the world’s elite with a penchant for the futuristic. Styled in silver and highly polished chrome, the 103EX features huge 28” wheels housed in distinctive individual guards and a modern sloping glass roof combined with the marque’s unmistakable front-end grille finished with a hand-cut lead crystal Spirit of Ecstasy. Measuring 5.9 metres in length, the roomy cabin upends traditional notions of what a car interior should look like. Being unencumbered with the task of driving, the owner has no need for a steering wheel, driver’s seat or other driving instruments. Seating, instead, is for two on a silk sofa while interior decoration is provided via panoramic windows, Macassar wood, wool and more silk. All this, of course, can be customised to the owner’s taste. Rolls-Royce has also done away with any threat of inelegant entry or exit thanks to a hinging roof and doors that allow passengers to stand up in the car before stepping out. Light projection provide a ‘red carpet’ effect while the absence of a traditional engine means increased room for luggage beneath the bonnet and in a side hatch at the front of the Rolls-Royce Vision Next 100. The final key feature of the futuristic concept is Eleanor, a virtual personal assistant named for actress Eleanor Thornton who is thought to have inspired the original Spirit of Ecstasy sculpture. Eleanor appears on a full-width OLED screen and, along with driving the car, can advise owners on route itineraries, remind them of appointments and make suggestions about, for example, recommended restaurants or events taking place nearby. Currently at the concept stage there is not yet an official release date for the Vision Next 100, although Rolls-Royce are confident that cars of this type represent the near future of the luxury motoring industry.